Whenever a company changes their logo, the Internet, especially those who design themselves seem to be outraged. I could count many examples, but most of them are already forgotten. And this kind of proves the larger point of this article. Michael Beirut once talked about how design nowadays feels like a spectator sport. Few players on the field doing the work, but millions judging and screaming on the side lines. Generally, there is nothing wrong with this. I think it’s good to critique and be critiqued. The only difference is the way we do it. And especially trying to find a collective understanding of knowing what makes a logo a good or a bad one. I’m always surprised by especially the outrage of the design community. We are the ones that should know that we just can’t judge a book by it’s cover. The cover of the book might be important to some degree, but if the book is really good, it won’t make a difference. And of course I’m not saying that the design of a book cover doesn’t matter, but it’s just a tiny piece in the puzzle. A logo is a visual piece in a bigger brand identity system. A logo embodies & transports the meaning of a brand, the logo is rarely the meaning itself. A logo mark just on it’s own is almost worthless. It’s almost impossible to judge the emotional value of a neutral logo mark. If you would look at the Apple or Nike logo before these companies existed, you would have had close to zero emotional reaction to these symbols. Of course this works only with pictorial logo marks such as Apple, Starbucks or the Twitter bird. Pictorial logo marks are usually well known symbols that have been simplified to represent something new in a different context. The original Nike logo. You like the logo today because you like the brand. A good logo can exist at any time when there is a beloved brand behind it with meaning. Because ultimately, a logo is good the moment it does it’s job, which is serving as a visual mark representing what the brand stands for. It’s essentially just a shortcut, a visual cue & trigger for something much larger. What I mean with that is that you can make any logo good as long as the brand behind is strong enough. And the brand is essentially a collection of everything the company has ever done or even said. The logo is just a representative symbol which echos what the brand is about. But still, there is a difference between a good and a great logo. Generally these differences only exist when it comes to practicality and functionality, and this is where we can judge a logo purely on it’s execution. But ultimately, we will judge a logo by the ability of how well it can communicate & trigger certain emotions that are based on the overall brand. A great logo is simple enough to be able to take on the meaning of the brand without adding too much of it’s own clutter & detail. Unless, the visual details are a big part of the brands heritage. A great example here would be the fairly recent Guinness re-brand, where detail & ornamentation is part of the brands history & legacy and therefore add a fundamental part of the brand to its symbol. To over simplify the Guinness logo would mean taking away it’s heritage, and there is simply no reason to do that unless you want to take the brand in a completely new direction. Basically you can say that the more visual character and personality a logo mark has itself, the harder it is for the logo to take on the brands personality & meaning. Unless of course, they both representing the same. A logo has to be easily recognizable. Which means, whatever logo mark you design, it has to be a shape that allows for quick recognition. Instagram actually does a pretty good job at this with their new glyph. While it seems somewhat generic at first, it’s easy to recognize from far away. 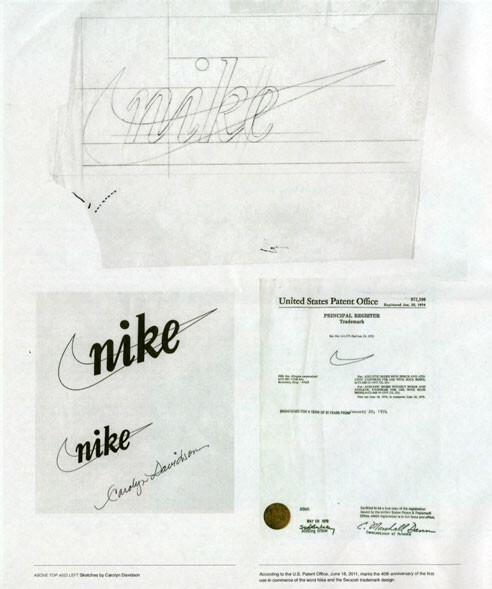 As an example, if you can take a pen and paper and roughly draw the Nike logo from the top of your mind within less then 10 seconds, it’s a pretty positive attribute for a logo. Not that you ever need that, but it’s a good exercise to test visual brand recognition to some degree. Certainly you wouldn’t be able to draw the Coca Cola logo, but most likely you would be able to draw their iconic bottle shape, which serves as much as an icon than their word mark does. It’s fairly simple, a logo should be functional. Most likely your logo will be used in many different scenarios, from digital to print, motion, physical product design and so on. A logo mark will also be used by many other people than yourself, so you want to make sure that whatever you design will stand the test of time. The more complex your logo mark is, the harder it will be to work with it, and the more chances there are for other people to mess it up. If you can only give away your logo mark to your partners or employees accompanied with a 150 page brand manual, you might want to rethink some of your decisions. A great logo mark is flexible in it’s application and should be able to be applied by anyone, even if that person is not a designer. It’s almost like you’re designing a toy for kids, thinking about every possible scenario and keeping it so simple, that no one can destroy it, or use it in wrong ways. A great logo should ideally reflect the time it lives in. Ideally it remains fresh & up to date to our current time. A logo can grow and evolve the same way a human being evolves over time. The reason we update a logo or visual identity is because the brand & character behind is changing and we like our visual center piece (the logo) to reflect this change. 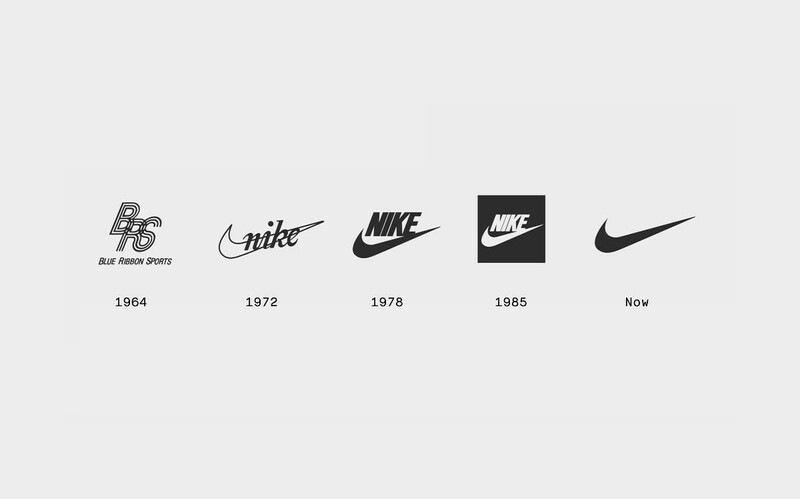 The Nike logo evolution above is just an example of how the brand identity has grown over the years. In the example of Nike, the changes don’t seem too radical to bother you. But in some cases, companies take more aggressive changes to their brand identity, and we as the design spectator usually don’t really know what the details are behind. Sometimes there are wrong decisions, sometimes there are reasons beyond of what we know about a certain company. Re-brandings and logo changes are difficult and ultimately there isn’t a “right” or default way to do it properly. When re-branding big companies it all comes down to communication and minimizing risk. It also depends on the company & brand itself. It’s a classic “it depends” kind of scenario. All we know is that we can’t judge a brand by it’s logo, the same way we can’t judge a book by it’s cover. The logo of a company is very important, but ultimately it’s just a vessel to hold whatever meaning you give to it. Having only a beautiful logo is like putting a suit or dress on a person without any substance or character. I hope this article gave you a little more insight into branding & logo design, expect more articles about this topic to follow. PS: I usually send out these articles via my personal email list before they appear in a more organized format on here. Thank you to all my readers for their input & feedback for shaping these articles.